At a time of unprecedented wealth, when almost one-half of all Americans own stocks and are able to watch their wealth and economic power grow on the nightly news, it is good to remember that over 800 million people worldwide are passing the same nights unable to feed themselves and their children. A full quarter of other Americans, especially children, have much in common with the world’s hungry, experiencing their own hunger intermittently. 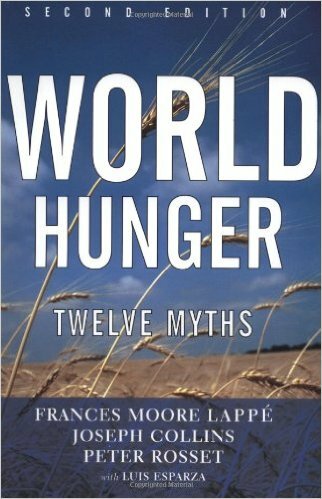 Frances Moore Lappe and co-authors Joseph Collins and Peter Rosset in World Hunger: 12 Myths are there to remind us. Remind us of the plight of the world’s hungry, as Frances Moore Lappe has done for over 20 years, and remind us too that there is enough food; that hunger is not necessary; that hunger is a social creation; hungry people a social phenomenon, and consequently one that depends on us and that we can change. While Frances Moore Lappe has been alerting the “baby boom” generation, as it has grown wealthier and older, to the alarming plight of the world’s poor and to the destruction of the environment to which their marginalization has contributed, she, herself, has remained as vibrant and timely as the search for an evening meal is in a poor household. World Hunger: 12 Myths includes snapshot reports from around the world, gathered from research, personal experience and the life situations recounted by the poor, which together create a picture very different from the one we receive nightly on the news, when we receive one at all. A bit like the internet, in “hit” after “hit,” 12 Myths exposes how some of the most simple givens of “common wisdom” about the lives we lead and the world in which we live, when turned on their head and properly understood, show the destruction of the environment, the exploitation of the poor, and the bad conscience with which the actions of our corporations and politicians leave us. Some of these insights into the lives of the poor and the role we play in perpetuating them, which have led me to reexamine my own assumptions, include: the role of multi-national trade of agricultural products in disrupting local farming and destroying the environment, the role of freedom and empowerment in preventing hunger, the importance of land reform in the economic growth of Korea, Taiwan and earlier Japan and the same importance of the lack of such reform in continuing food problems in much of the Third World. Multinational corporations and multilateral institutions, including the World Bank, International Monetary Fund and the G-8, are all seen as reinforcing a logic of profit and exploitation of the land and people. Does this system work for the betterment of all as proponents of the “free market” would contend? In a telling exchange reported in the book with Milton Friedman, a leading economist of the free market school, the authors answer his claim that the logic of the market best allows for the expression of individual preferences in the production of goods and services. The authors reply that it could hardly be the preference of much of the world’s population to suffer from hunger in the midst of plenty. What the market really achieves is the expression of the will and desires of those with money; these desires including keeping their money and possessions whatever the consequences. Other myths also go the way of chaff from wheat, lightly carried in the wind of cumulative human experience. The penultimate chapter, “Myth 12. Food vs. Freedom,” contains an excellent analysis of the disquieting effects of the growing disparity of wealth and incomes in the United States on our political process and ultimately on our freedom. The close relationship of the loss of freedom and empowerment, and the social phenomenon of hunger, should help explain the phenomenon of a society with an ineluctably growing “hunger” problem in the midst of unprecedented human riches. World Hunger: 12 Myths is an excellent introduction to the world the majority of people live in as opposed to the world of stock market reports and Christmas shopping. It is also an excellent challenge to many of the “givens” of our other world and a call to us to rethink our priorities and where we are going. Leo Vox is the pen-name of an economist from the United States Agency for International Development.